The What: 1 Beyond, Inc. is now shipping 1 Beyond Collaborate AVS, a new videoconferencing solution. Collaborate AVS offers an enhanced conference or meeting experience by automatically focusing the camera on the active speaker. The What Else: Up to eight cameras and 250 microphones can be placed anywhere, even accommodating rooms where the presenter and audience face different directions. The system is engineered for easy configuration via a browser-based interface. Other features include side-by-side Conversation Mode when two people are in conversation, and integration with the 1 Beyond AutoTracker camera, which follows a mobile presenter. Collaborate AVS supports the newest push-to-talk or voice-activated table-top mics or ceiling arrays, including Shure Microflex Advance, Shure DDS 5900, Shure DCS 6000, and 1 Beyond AVS Wireless Microphone systems . In addition to standard codecs from Polycom and Cisco, Collaborate AVS works with software conferencing solutions like Skype, Zoom, BlueJeans, and GoToMeeting. The software can run on the Collaborate AVS system, so a separate computer is not needed. 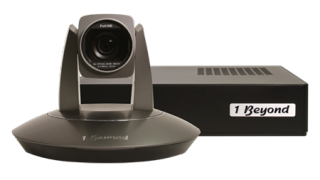 The Bottom Line: Well suited for larger meeting rooms, classrooms, courtrooms, and panel discussions, Collaborate AVS gives a close-up view of the person talking and can be used for videoconferencing as well as recording, streaming, or IMAG (Image Magnification). No camera operator is required as switching is automatic. Standard Collaborate AVS packages include two or four 1 Beyond PTZ-S20 cameras and start at $12,995. Systems are available through AV integrators.